Once you’ve met them, you’ll never forget them. A small Mexican village is ransacked a couple of times each year by a dangerous bandidos gang. 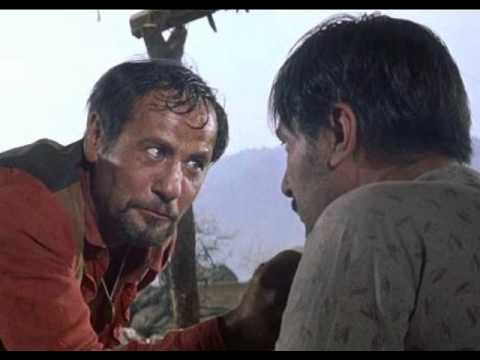 Led by the treacherous leader Calvera (Eli Wallach), the residents are hungry, oppressed, and afraid. They could fight back, but with no weapons training, their effort would be futile. Needing assistance, village leaders go to the U.S. in search of firearms. Upon their search, they find something better. Experienced gunslinger Chris (Yul Brynner) is asked to help defend their place. But he can’t do so alone, so he recruits six others to provide support. Together, The Magnificent Seven just might have a chance in turning back Calvera and company. 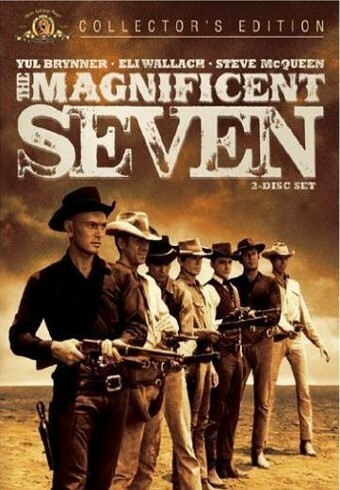 While I wouldn’t call it an absolute classic regardless of its genre (only a few films I believe can lay claim to that mantle), director John Sturges’ The Magnificent Seven, an Americanized remake of the often-imitated Seven Samurai, is an absolute classic for its Western genre. It is the type of film that might not appeal to fans of Westerns, but those who have even a little appreciation for the old frontier that have never seen this feature need to. Perhaps no genre of movies does credits like Westerns do. There’s something about seeing all of the names in a production set to the background of the particular locale that sets up the tale. Add in one of greatest scores and themes of all time done by one of the greatest composers of all time in Elmer Bernstein and TM7 is as atmospheric as they come. Admittedly, the film is a little long for how straightforward it is at two hours and ten minutes. Much of the first 40 or so minutes are devoted to getting the group together and efforts to flesh out everyone. A few attempts at individual character work, but these guys are more or less chaotic good guys who are in a shady profession, but have enough heart to do the right thing. But, this 40 or so minutes does feature some great scenes that aren’t full of shootouts, but simple, occasionally odd, banter and even some humor. 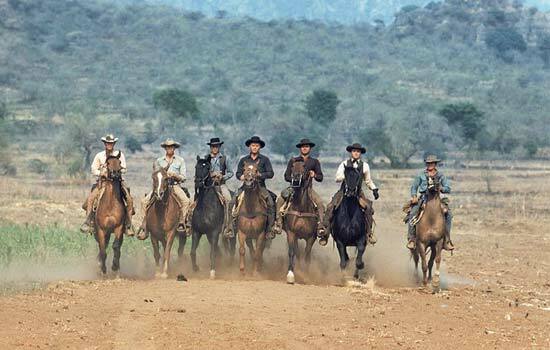 But c’mon, it is the shootouts and old-fashioned western action that makes The Magnificent Seven so fun to watch. Sturges, already very familiarized with the genre and other period pieces by this movie’s release, stages some very impressive standoffs with steady and maintained camera work. Not everyone can play a gunslinger, as it takes a certain persona and charisma. The casting is superb with this one. Though some of the guys feel interchangeable and underwritten, the guys playing them are believable as tough and skilled cowboys. Steve McQueen and Yul Brynner are the biggest stars, and it is the latter that outshines all (in what seemed to be a constant wars of alpha actors during filming) as the leader. His gaze, demeanor, and even Russian accent all add to his presence. He’s undoubtedly one of the greatest cinema gunslingers of all time fighting against an underrated villain in Eli Wallach’s Calvara. He’s actually not on screen a ton, but when he is, he is the villain Calvara. Westerns are usually the most basic tales and plots to be had. Basic isn’t a bad thing, however, as long as it’s done superbly. The Magnificent Seven is as basic as they come, but with brillant casting and direction that elevates it to quite the high level. Photo credits go to YouTube.com, britannica.com, tvtropes.com, and commentarytrack.com. Not going to lie, I am very curious to see how the Denzel remake will compare to the original. Same. As I was watching I kept on thinking that the remake, despite what my dad says, could be amazing. I truly feel like this one deserves a remake for a new generation, and I think that Fuqua has more than enough style to pull it off. Great score. It is indeed a classic. As you say it is pretty basic but is done so incredibly well. I have a rewatch in the near future just to prer for the remake. For sure. I’d say I liked the score more than any single aspect. Agreed, this is a classic of its genre. The runtime feels okay to me, but that’s probably because the first time I saw it was shortly after seeing Seven Samurai for the first time. This shaves over an hour off of that and still gets the job done. Looking forward to the remake to see how it holds up. Same. I think this actually warrants a remake and under the hands of Fuqua could be special. He may not always bring substance to his movies but he almost always brings style.